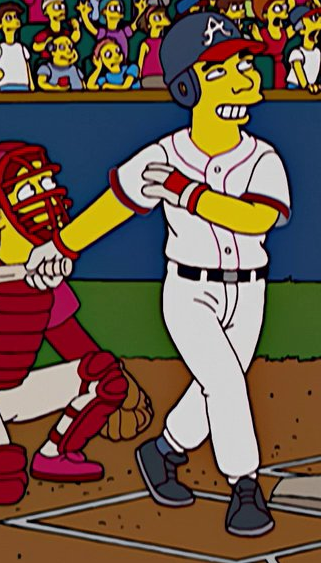 Joe DiMaggio is a former New York Yankees player. Joe had a notable and valuable rookie card. Homer gets $5 and a Christmas gift from Mr. Burns, like all the other Springfield Nuclear Power Plant employees. 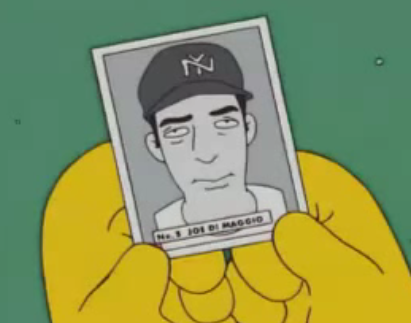 However, Mr. Burns gave him the valuable Joe DiMaggio baseball card. Homer takes it to Android's Dungeon & Baseball Card Shop and gets all the money in Comic Book Guy's cashier for the card. Joe DiMaggio and Joe Torre were both later seen in their New York Yankees uniforms in a Jock Center commercial. Modified on July 16, 2017, at 15:20.